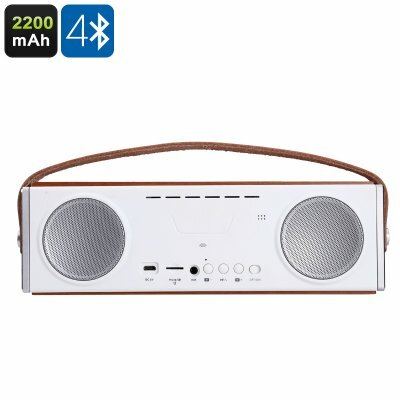 Successfully Added Bluetooth Speaker - 2200mAh, Double Speakers, SD Card Slot, Handsfree Calls, Bluetooth 4.0, Stylish Design to your Shopping Cart. With this beautiful Bluetooth speaker you’ll be able to listen to your favorite tracks at anytime and anywhere in style. Its stylish body has been crafted out of aluminum alloy, wood, and leather. This gives your wireless speaker a high-end look that is sure to impress. Thanks to its leather strap, it can be easily carried around no matter where you’re headed. With its remarkable design, this Bluetooth speaker is great for both indoor and outdoor usage. Whether you use it to pimp up your interior or to listen to tracks on the go – this wireless speaker is sure to meet your demands. Simply sync it with your phone, tablet, or laptop, and you’ll be all set to enjoy your songs in great audio quality. The wireless Bluetooth speaker packs a built-in 2200mAh battery. This cell provides up to 5 hours of continuous usage time and can be easily recharged. With all this power, you’re certain to have enough juice to get through a music-filled day. The next time you head out to the park or spent a day at the beach, you’ll be able to enjoy the latest songs together with all your friends. It features a 10m Bluetooth range thanks to which you’ll be able to move around without disturbing the Bluetooth signal. This Bluetooth speaker comes packed with two great speakers that produce audiophile-grade music quality. When synchronized with your smartphone, it even supports hands-free phone calls. From now on, you’ll be able to easily answer incoming messages without needing to search for your cell phone. It furthermore supports an SD-card slot that lets you insert all your favorite songs. This allows you to listen to music even while you do not have your phone or tablet around. The Bluetooth speaker is compatible with both iOs and Android devices. Nothing wrong to say about it.